Africa Up Close is the blog of the Woodrow Wilson International Center for Scholars' 'Africa Up Close' is the blog of the Africa Program at the Wilson Center, providing a nexus for analysis, ideas, and innovation for and from the continent..
Burundi: Free and Fair Elections? 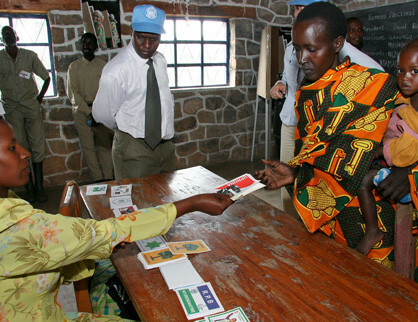 Recently, Olivier Bucyana penned an important post on the limitations of elections to measure democratic consolidation. He explained the importance of creating the necessary space for ordinary citizens to participate in decision-making processes that are related to performance of service delivery. Indeed, despite the widespread and regular occurrence of elections in Africa, few are the cases where electoral outcomes drastically improve citizens’ well-being. Similarly, while elections are symbols of democratic consolidation, the mere fact they occur in a closely monitored environment where fraud on Election Day is kept to a minimum, does not mean they are free or fair. © Copyright 2019. 'Africa Up Close' is the blog of the Africa Program at the Wilson Center, providing a nexus for analysis, ideas, and innovation for and from the continent.